I have experienced something sublime through electronic music, and expect to do so again, many times over. I think an art like electroacoustics will always have this potential. If you feel like testing the limits of your ability to discriminate between mind and matter, the Akousma festival is running this week for its 13th edition. Usine C will be its main venue, along with the Conservatoire de Musique de Montréal and the Maison Symphonique de Montréal, among others. Akousma showcases recent developments in the electroacoustic community in Montreal, across Canada, and abroad. For those unfamiliar with the term, I understand electroacoustics (EA) to be a discipline, which focuses on the transformation of sound. Under the radar, Akousma offers attendees a wealth of experiences in sound, ranging from immersive reflections on urban soundscapes to mazes of cultural reference points as voices and noise. “Akousma’s greatest strength is that it features a lineup of artists who don’t always cross paths,” said Matthew Schoen, creator of the festival teaser for this year. AKOUSMA XIII from Matthew Schoen on Vimeo. 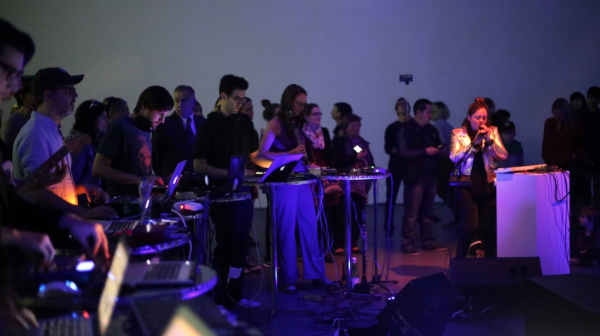 The Concordia Laptop Orchestra—CLOrk—a collection of intersecting styles itself, will be performing during Akousma. Some orchestral members come from an EA background, while others use more traditional instruments, but with an aptitude for more alternative performances. Eldad Tsabary, an EA professor at Concordia and creator of the CLOrk, attests to the structure of the orchestra being democratic. The pieces created for their performance on Friday, for example, are composed collectively—no one in particular owns them. Live electronics is also foundational for projects such as CLOrk. That is, performance through electronic mediums, but with the unexpected need for improvisation and communication. For EA and related artists, using live electronics has the potential to develop a stronger ear, more robust technical and technological skills, quick troubleshooting, and better communication skills, according to Tsabary. The setting forces artists to synthesize their diverse ideas and experiences. “By being in CLOrk, it has allowed me to grow as an artist because of the sense of community we have in the group,” says Georgios Varoutsos, another member of the orchestra. But beyond the social, what about the metaphysical? I experienced Chioini’s initial work at Conservatoire as physical. It made the hair of my skin stand on end, yet also set a reel of tactile substances in motion within my mind such as tin, rubber, and wood. Chioini explains that my perception of his early work (such as Grand Jeu), as physical is probably related to his use of subwoofers, rhythmic patterns and percussive sounds, gathering from underground electronic music as inspiration. He stresses the importance of context, though. Chioni’s work at Conservatoire was essentially meant for deep listening. While his early aesthetic was present in his performance at Mutek this past June, his approach was different. At Mutek, I was moved to dance with no A/V reel in my mind, a genuine response to a set that Chioni says “was mainly club tracks.” There was still some entropy, but it was smoothed out for a Thursday night crowd. At Akousma we can expect an extension of Chioini’s intellectual creative process, that of a world within a piece. You will not be able to dance, as at Mutek, but you might notice the roots of his inspiration. Exploring the shape and limits of soundscapes will be our trajectory with a minimalistic facet, as Chioni has begun to explore this aesthetic in his experimental work. Both Chioini and the CLOrk will play this evening at Usine C. Akoumsa ends on Oct. 22.